I’m preparing to host my very first Easter dinner tomorrow – a totally plant-based menu with all the fixins! Go big or go home, I say. Usually we go to my in-laws for Easter, but this year my sister-in-law had to stay close to home for an event so we offered to host. I’m making a ridiculous amount of food including many recipes from my next cookbook. So pumped. I just need to scrounge together enough chairs and pray that we all fit at our table! Ok, that is definitely not happening…but what would a big family get together be without a kids table?! This pie, however, came together without a hitch. Sa-weet. If you’re like me, you might even find you have all the ingredients on hand which makes me want to cry happy tears because I didn’t need one more grocery trip on a holiday weekend. Or should I say Eric doesn’t need one more grocery trip on a holiday weekend…bahaha. I don’t know about you, but when I realize that I have all the ingredients for a recipe I’m like that Ikea commercial, only instead of running to the car I’m running to my kitchen… START THE OVEN, START THE OVEN! I’m not weird, not weird at all. 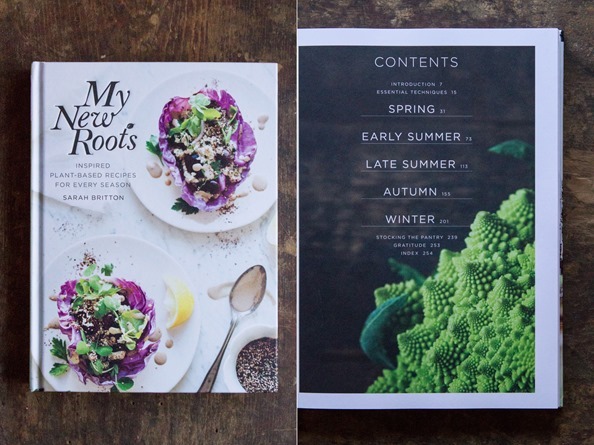 Last year I had the opportunity to preview Sarah Britton’s debut cookbook, My New Roots: Inspired Plant-Based Recipes for Every Season, based on her beautiful whole foods recipe blog. I’ve long admired Sarah’s unbridled enthusiasm for plant-based food; in fact, I don’t know if I’ve ever come across someone who is so passionate about vegetables, not to mention, knowledgeable about how they impact our health. This cookbook is gorgeous with beautiful food photography and interior design (I’m a bit of a cookbook nerd these days, often gushing over paper stock of all things). There are 100 creative vegetarian recipes with many vegan options. Some of the ingredients are a bit uncommon or difficult to find, but I expect if you have a solid farmer’s market and health food store handy you’ll be able to find many of the ingredients in the right season. Just in case you aren’t sure which ingredients are in season, the cookbook is conveniently divided into 5 sections by season (spring, early summer, late summer, autumn, and winter). I love that summer is divided into two seasons; it totally makes sense because there’s so much coming into season over the summer months. One thing’s for sure, Sarah’s recipes will help you bust out of a cooking rut and get adventurous in the kitchen. 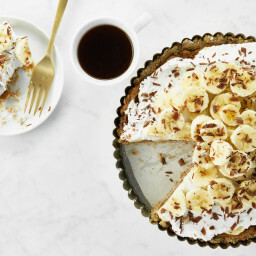 Today, I’m excited to share this dreamy Banoffee Pie recipe from her new cookbook. I’ll be serving it tomorrow along with a few other desserts. I hope you enjoy it as much as I did (yes, I had to eat a slice before serving it tomorrow…don’t judge). I’m predicting it won’t last long because who on earth can resist the combo of coconut whipped cream, banana, oats, and date caramel? Anyone? This Banoffee Pie is decadent while still feeling super light and healthy. The almond-oat crust is layered with sticky date caramel, sweet banana coins, luxurious whipped coconut cream, and shaved dark chocolate, for a pie that's sure to impress. This recipe is adapted from My New Roots: Inspired Plant-Based Recipes for Every Season. Copyright © 2015 by Sarah Britton. Published by Clarkson Potter, an imprint of Penguin Random House, LLC. For the crust: Preheat the oven to 375°F (190°C). Grab an 8- to 10-inch tart pan (I use a 9-inch) and lightly grease the base and sides with coconut oil. Cut a circle of parchment paper to fit on the bottom and place it inside. This will prevent the crust from sticking. Add the almonds into a food processor and process until they are the texture of coarse sand. Now add in the oats, cinnamon, and salt and process again until the coarse, sandy texture returns. Add the melted oil, maple syrup, and water, then process until the mixture comes together and no dry flour remains. The dough should stick together when pressed between your fingers; if it's still too dry, try adding another teaspoon or two of water and processing again. Crumble the dough all over the base of the tart pan in an even layer. Starting at the center, press the dough flat into the pan with your fingers and work your way outward and up the sides. If the dough starts to stick to your hands, lightly wet your fingers every now and then. With a fork, poke the base of the tart about 15 times to allow the air to escape while baking. Meanwhile, make the Raw Caramel Toffee: Add the pitted dates into a bowl and pour boiling water over top. Let sit for 5 to 10 minutes, or longer if your dates are firm. Drain the dates and add them to the food processor along with the almond butter, lemon juice, salt, and vanilla bean seeds (if using). Process until smooth, stopping to scrape the bowl as needed. Spread all of the whipped coconut cream on top of the banana slices in an even layer. Now place the remaining banana slices on top of the pie in a circular pattern, overlapping and stacking them to create height. Garnish with shaved chocolate (I like to shave it with a vegetable peeler) and serve immediately. Leftovers will keep in the fridge in a sealed container for up to 3 to 5 days. I don't recommend freezing this pie, as the banana slices get mushy after thawing. * To save time, you can swap the homemade coconut whipped cream for store-bought coconut whipped cream (such as So Delicious Coco Whip). Be sure to let it thaw before use. To those of you celebrating this weekend, I wish you a lovely Easter! Spring is officially in the air. ahhhh. Date caramel = genius. My “desserts to make” list is growing longer and longer…that’s not a bad thing. Wow! This pie looks incredible and is totally the best idea ever for a Family Easter dinner. You were totally right when you said that the recipe has common ingredients that most of us would already have in our cupboards – I have every single thing required and I’m really having to control myself from jumping up off the couch and pulling out everything to get started on this! I love the IKEA analogy – pure perfection! It looks so good, definitely trying this one. An entire plant-based meal prepared by you sounds amazing! And did I read right.. you’ll have a 2nd cookbook out?! YAY! I think a entire plant based Easter menu sounds delightful. You are right, spring is in the air, although the day after Easter my 5 year old asked if we could celebrate Christmas! This pie looks most excellent, I really enjoy learning about food on Sasha’s my new roots blog as well. And of course I love oh she glows! I can totally understand making a date caramel. My favorite snack is Medjool dates + homemade almond butter, but I hate soft/squishy dates. In an attempt to make them chewier and tougher, I put them in the oven on its lowest temp for a few hours to dry out. Not only did they dry out, but they tasted so rich and caramelized! I don’t have time to hang out and do that with them all the time, but they were amazing!! This looks soooo yummy! I love finding new healthy dessert recipes to try. I always enjoy making your recipes and this one sounds amazing! Will definitely make this soon! Thanks! This book looks awesome and the pie looks even better! I’ve never really had any banoffee desserts before but I love both banana and toffee so I’m sure I’d like this! i was just reading in Sarah’s book earlier, I love the idea of dividing it by season. Beautiful cookbook. Hers was the first plant based blog I found, yours came shortly thereafter. I have a bunch of plant based cookbooks now but to tell the truths yours is the only one with food all over it from using it so much. Whenever I need a recipe I keep on coming back! I have at least 5 friends (omnivores) who also own and hopefully cook from your book, if not they are missing out! Happy Easter! Thank you , this looks yummy. Loveliness. I have been following My New Roots and seeing so many gorgeous photos of the book. Happy to see an actual recipe so I know what to expect from the whole gorgeous book. This looks amazing! and I love Sarahs website, and had no idea her cookbook was broken up into seasons…that’s my jam:) Thank’s for sharing this lovely recipe. And you gotta have the kids table! This is my most favorite pie in the world and I’m always looking for one that does justice to the ones I grew up with in England, so I am definitely going to try this one! This recipe sounds delicious and I am thrilled that I have all the ingredients! Can’t wait to make it. I’ll also be hosting Easter, I wish I could say it’s totally plant-based but I have a few rebels attending that won’t think it’s Easter without a ham. Here’s my menu I’m so proud to share: Sunny White Sangria, Crispy Smashed Potatoes with Avocado Garlic Aioli, Mini Fruit Kabobs, Creamy Avocado-Potato Salad, Tropical Mango Banana Kale Salad with Creamy Pineapple Coconut Dressing, Red Quinoa and Black Bean Vegetable Salad, Roasted Beet Salad with Hazelnuts and Fresh Strawberries. Any of those recipes sound familiar? Love ALL your recipes. That is amazing! You have lucky guests. Happy Easter! Whoa… Mmmm… So while you are recipe testing for a cookbook, it’s a happy coincidence that this year you’ll be hosting Easter. Of course you had a taster slice first: have to know if your first rendition of a recipe is good enough to serve company. Hey Ange, I like your adaptations, and yum–I ate the webpage :) ‘cos babyweight loss is at a plateau so this was a perfect compromise! This looks absolutely amazing. I must makes this when I come home. I’ve had trouble with the coconut whipped cream ever since all the cans added guar gum to the ingredients. I have checked every brand and everyone seems to have it? You can whip up your own from a can of full-fat coconut milk. I first read about it here on OSG, so if you do a search you should be able to find Angela’s instructions. It is amazing! Ooooh, you mean the cans of coconut milk have guar gum! Gross. I never noticed that. Thanks Rebecca– I’ve been searching for a brand of coconut milk without guar gum too. What store did you find yours in? Does anyone else have any brand recommendations? I do what I call the “grocery aisle shake” where I gently shake the cans and then pick out the ones that feel thicker (aka no liquid sloshing around). Works every time! So far my favourite places in the GTA to buy coconut milk is T&T (or other asian stores) and Loblaws. I use the green Arroy-D cans. They are gum free and work great! Thank you!! I will have a look. I live in Hamilton and feel like every can I check has it. I must have missed this brand. I just bought Native Forest and they do indeed have guar gum! No idea why but fortunately my whipped coconut cream turned out great! I can’t wait for my copy to arrive. And this recipe looks just so so yummy! Happy Easter to you and your family, Angela! I’m getting caught up on your blog and just read your last post. Love and light your way, girl! <3 I wish we could always bring each other up instead of tear each other down! I just wanted to let you to know that I started reading your blog right when I started my vegetarian journey a couple years back and your blog was a major inspiration for me in becoming vegan and SO passionate about beautiful plant-based foods! You know which decision is best for your family and I love how open and honest you are on your blog. All the best! ohh man this look tasty! I was thinking about making my favorite raw vegan blueberry banana muffins but I think I want to make this instead!! :) Thanks for the killer recipe Angela! This pie looks lovely. It’s so nice to realise everything you need is in your cupboard and ready to go. I try to make as many meals as possible without special trips to the shops. This ususally requires research, planning and creativity. Your site always provides good recipe inspiration. omg, it looks so good, i love bananas! Looks really delicious *_* I’ve to taste it! Angela, this looks amazing – and I love your tweaks. Thank you for all that you do! I got a great giggle when you mentioned the burned desserts! Been there, done that, LOL! It’s a comfort to read that you have ‘moments’ too! Okay…I’m gonna go back and drool some more over that pie! Enjoy your celebration today! I’ve been trying to figure out how I could make caramel/toffee and this is the answer! Can’t wait to try it out. I love your cookbook. I made the Tex Mex Casserole last night and it was deeelish! This looks wonderful – the addition of fresh bananas must make it super tasty! I love date caramel! I can’t imagine ever wanting “real” caramel anymore. This looks delicious– the crust especially! Scrolling those pictures down it’s like being in the kitchen and looking at the cake being prepared! Shame i cannot bite my screen…well…I could! :) Beautiful cake! you had me at the AUDIENCE MEMBER. Could I please get a substitute for the oats? Yumm! I love Oh She Glows, I love My New Roots, put them together and there is no way anyone anywhere will be disappointed! And they aren’t! This sounds incredible, and your adjustments sound perfect! I’m so pumped to try this! I’ve been dying to make Sarah’s Banoffee pie but have been putting it off out of sheer lazyiness haha. Now I’m definitely gonna make it asap! You can’t go wrong with bananas and toffee. I am weeping over how gorgeous that pie is! Just lovely! Oh wow this pie looks so good! This recipe is calling my name. Do you think I could mash the bananas and beat them into whipped coconut cream? I would love to make a “banana cream” topping instead of cream + banana slices. And then, of course, cover it with tons of shaved chocolate! I just have to say Angela, you take the most beautiful pictures I’ve ever seen. Ever. And that’s saying something cause I also read Kathy’s blog Healthy.Happy.Life and wow she takes beautiful pictures. But your’s take the cake. I won’t be making this recipe cause I hate bananas and I don’t like pie, but thats the most beautiful pie I’ve ever seen. Your pictures are amazing. You’re an amazing photographer. 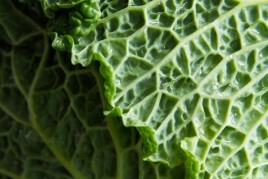 And i LOVE the picture of the kale? on your Food for Thought post. It’s beautiful. Oh and I did read that post. And I was like whaaatt?? I didn’t know you wrote a post on what you’d feed your baby. So I read that post and I could not agree with you more. I’m sorry people were criticizing you. You don’t deserve that. I’m vegan too and I couldn’t agree with you more. I’m not gonna put a label on my kid. Kids are too little for “vegan”. They’ll decide when they’re older what they wanna do. You don’t wanna burden a little kids with such a strict label. I don’t ever to people even call myself vegan because people just take that word so seriously and offensively sometimes. I just say I don’t eat animal products. I am vegan and have been for years and so happy I am. But a lot of adults can’t even handle the word vegan. That’s too much pressure to put on a kid. It’s too much to explain. Just everything. I get it. But anyway I love ya Angela. Been reading your blog for a few years now. You’re a beautiful person. Ang, I don’t have a tart pan. Could I use a glass Pyrex pie dish instead? I’m not super crazy about bananas. I’ll probably omit the top layer but definitely put the bananas on the inside layer. As always, superb photography! Hope your Easter was wonderful. Can’t wait to see photos of your beautiful babe and your food! I used a glass pyrex pie dish, and it worked great!! Having a kids’ table is a great idea! I love hearing bits and pieces of their conversations when they think no one’s listening (creeper status: expert :) ) It can get very interesting and surprisingly mature at times–they were talking about politics once! Not sure I would even talk about that with my friends; ha! I love that this pie isn’t sickly sweet! Yum! Angela, really: with grace and style, you go from being criticized, to PIE! A beautiful, delicious, springy pie. Seriously, good for you. If pie doesn’t symbolize peace and happiness, then I just don’t know what our world is coming to. Keep up the good work! Can’t wait for your next book. Hope you had a successful, fulfilling Easter gathering with your friends and fam. I really loved this recipe! Although apple pie is my favorite I am going to include this recipe in my menu. Last time I had messed up my apple pie by using 3 tablespoon of cinnamon. I believe a metal pie dish helps a pie cool well. When I make my apple pie I give it sufficient time to rest or the fruit juices will run. 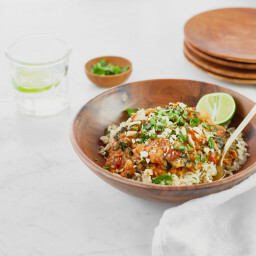 If you are like me looking for a salty treat too make sure you try this out http://www.agein.com/savory-chana-chickpea-masala-6763. Love this “clean” banoffee pie! My 4 month old son is also enjoying kitchen time, I just plonk him in his seat on the counter, and we chat about the food I’m making! Thank goodness April is my birthday month because I SO want a copy of that book! This recipe looks and sounds utterly yummy. Thanks as always for sharign your inspiring photography. Yum! This looks so lovely and delicious. And I’ve never heard of this cookbook. So thanks for the hot tip! Can you make this pie with peanut butter instead of almond? I wonder if you tried it, or what you think it would be like. 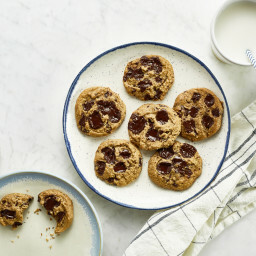 Thank you for sharing a simple yet heavenly dessert! Looks AMAZING! my oh my this looks awesome. drooling! This looks fantastic! Can’t wait to try it. Thank you. My husband will adore this…I’m thinking spring surprise dessert right here. Hope you had a great Easter! What an amazing dessert! I can’t wait to make it! I was wondering of the coconut oil in the base could be substituted for applesauce by any chance? I’m off to the kitchen now making pie! I think it’s baked in a special kind of pan. The flat bottom can be pushed up and out of the ring around it. Can’t think of the correct name for the pan, but you can buy them at any kitchen store. I think Angela probably took it out to make it easier to serve it. This is perfect, it looks totally scrumptious and decadent, I have to get the book. The “start the car” reference had me in stitches. That’s exactly how I feel! Coconut and syrup are both high in triglycerides. Some people need to be careful. Too bad I did not learn about this recipe before Easter, but still very excited to try this for our weekend get together tomorrow! I’m also not a fan of sunflower seeds so it’s nice to know that I can replace it with almonds. 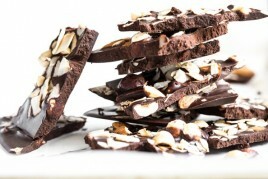 I love almonds~ BTW, your pictures look great and oh-so tempting! Thank you for sharing this recipe. I am more than excited to try it out!! Your gorgeous food photos are really enticing! I have followed My New Roots for ages, and came across your blog when she reviewed a recipe from your cookbook. I promptly ordered a copy and have followed Oh She Glows ever since :) I received my copy of the MNR cookbook and this post has made me even more excited to try out the recipes! Wow this looks sinfully delicious! Crust looks mouthwatering, yum! Angela this looks amazing! I’ve been so inspired from your recipes and your photography that I recently started my own! Thank you for spreading health, inspiration, and positivity! Nice recipe! Please, could you put up a recipe for diabetics! Thanks for the good job. This looks so yummy….I am just starting out with cooking with vegan recipes and this one caught my eye because it looks better than the banana cream pie I always make that has all the sugar and dairy. I will definitely be following your blog and trying all the recipes you have posted! This pie looks exceptional. Only problem is that every time I buy bananas for this, before I turn around they are all eaten!! Have to try this again next time I go produce shopping. You have a wonderful blog and way about your writing. I hope you continue it for a long, long, time. Thank you! will need to try it out! This is an awesome recipe! As a health blogger myself, I’m always trying to find new vegan dishes to try out. 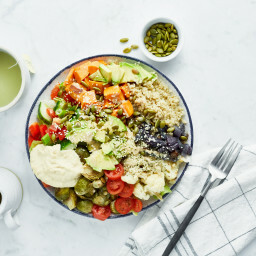 If you are interested in vegan restaurants check out my most recent post: http://www.thebrookeeper.com/food/5-awesome-vegan-eateries-you-must-try/ . Happy blogging! Oh my goshhhh this looks absolutely incredible. I think I need it. Right now. It is great to find options of sweet foods while still being light and healthy. I am not so big on sweets, except of course for chocolate, but my husband and 10 year daughter are. I am now looking for healthy options to give them that sweet stuff they crave for. Our plan is start cooking some new healthy dishes together as a family activity. This pie looks as a very good option to try out. I wanted to bring a cool dessert for a girls only camping weekend and this looked perfect. We had it for breakfast. And…it was perfect. Just made this and it was a hit! Note: I used a glass pie plate and my crust took about 17 min to bake up. I suspect yours was quicker considering you used a metal plate. I also didn’t have any issue with air escaping. I am making this tonight! How long do you think it will keep in the fridge? Very innovative way of combining banana pie with some ingredients that compliment it the best. Great recipe. That pie looks delicious – I really love the recipes on the My New Roots, I should get hold of the book sometime! Hope your Easter dinner went well. Oh. My. Goodness. This recipe is absolutely ahhhhhmazing!!!! OK I am so fed up with trying to make coconut whipped cream. I can’t tell you how much time and money I’ve wasted to get nothing in return. On top of that I cut my hand on the can and needed stitches. Here’s what happens: I open the can and it’s in three layers. Liquid on the bottom, a small amount of fat and a large layer of a solid that looks like oil. When I try to whip the fat I only get a small amount. If I add in the fat, it’s chunky because it wont break down. What am I don’t wrong? Please help. I have never commented before. But love all your recipes! I know it’s going to be good, if the recipe came from you! Can’t wait for the next book. Finally got a chance to make this lovely recipe. The Bomb! Everyone gave it high ratings. Totally Thanksgiving worthy for my non vegan friends! Loved it! For those avoiding refined sugar like my dad, who has cancer, (I’m sorry, but even pure maple syrup is a refined/processed sugar with detrimental qualities) you could substitute it by adding stevia to the water used in the crust along with a little bit of maple flavoring. I’m betting you could also sub out the coconut oil in the crust (again, for those with cancer/diabetes, etc.) with perhaps applesauce or something similar. Wow! I’ve never tried combining all these flavors in a pie, but can’t wait to try it. I love the fresh banana idea. Thanks for posting! How did I miss this post???? This is the perfect recipe for the anniversary dinner I’m putting on this weekend for my parents :) Cannot wait to make it!!! 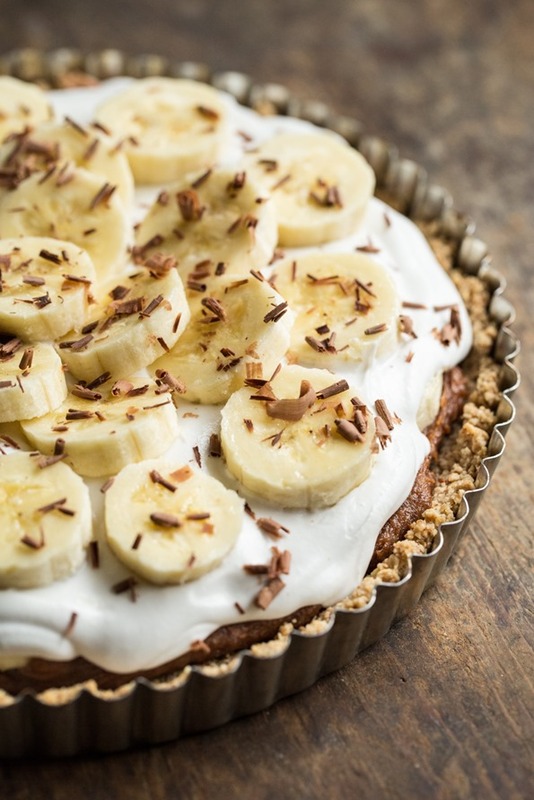 This Banoffee Pie recipe is pure bliss! Thanks! You are making my mouth water! This looks delicious! I just discovered your site and am busily adding new recipes to my collection. I love that you share healthy tasty recipes with great photography. This was delicious! So goood. What is this scrumptiousness??? I must have it! It looks amazing! 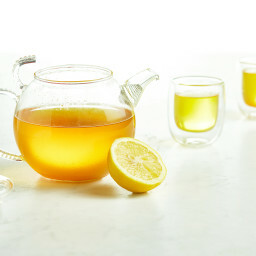 By the way, you have so inspired me on my journey of healthy eating — and getting me to dive into the world of vegan cooking — that I nominated you for the One Lovely Blog award (nomination post here: http://healthylittlechanges.com/2015/04/21/a-blog-award-plus-my-10-favorites/). Thank you for inspiring me and taking the scary (and yucky) out of vegan cooking! Thi looks tdf! Will definitely try it this weekend. What A great recipe! Looks delish! Hello Sarah. I just discovered your absolutely fabulous blog and I’m excited about trying some of your recipes. I followed you on Bloglovin’ too. I have been a vegetarian for many years but now I am starting to have some minor health issues so I need to get more serious about eating really healthy – no more junk and processed foods.One problem I have is that I don’t like bananas. I know I ought get over it and acquire a taste for this useful and healthy food, but do you have any suggestions for substitutions? Thanks for the all the effort you have put into this beautiful website. I hate bananas except unless they’re in smoothies. But this looks so good! I wonder what fruit I could replace the bananas with… Strawberries? This looks so good. We have been loving the whole date=caramel idea for a about a month or two now, but this takes it to a whole new level. Thanks for the recipe, I can’t wait to try it! This looks really amazing and cool! I’m signed to your mailing list but not getting any emails from your site. Can you please let me know what I need to do to fix it. You haven’t posted since early this month…is everything okay? Could I use almond meal leftover from making almond milk in replacement for the almonds? If so, how much should I use? If not, I will stick with the recipe. Thanks! Wow, this looks delicious! And, what a beautiful book. Definitely gotta check that out! I’ve been looking for a recipe similar to this for my family! Looks amazing, thank you so much!! Im not sure if you are aware but the recipe index search on your blog has been missing for the past week. Its the one where you could search by course or ingredient. Will you bring it back anytime soon? It was so helpful! Thanks! Omg, this looks amazing! Being half British, i absolutely adore banoffee pie … but not all the sugar and fat that normally comes with it! I am excited to give this recipe a try in the near future and thank you for sharing. You have inspired me to eat in a clean and healthy way and my husband and three littles love the food I have made from your creations! Your cookbook is amazing and I have bought it for all my friends! Thank you for finding time to share such yummy healthy meals! I live in Kentucky and today was the Kentucky Derby, where the very best horses race. Anyway, we always have a Derby pie, which is basically chocolate-bourbon pecan pie. I wondered if you could capture these flavors but in a healthy fashion! If you feel so inspired I would be so appreciative!!! This was very good, and even the non-vegans in the family enjoyed it, definitely going to look into the book. I stressed about the guar gum comments since I could not find any cans without it. But as another commenter said, if you shake the cans in the market, and buy the ones that don’t slosh (like they are solid) then you will have plenty of solid cream to use even if they have guar gum. Taste of India brand was consistently solid here in Boston. Don’t be afraid of the unsweetened whipped cream (as I was), it will all taste great once assembled. I was able to keep it in the fridge for hours before serving, but the cream does look better right after you make it, it solidifies a little bit in the fridge. Excellent for breakfast the next day! Wow–this looks so amazing. I have gradually been moving to a grain free diet (I already have Celiac Disease so this isn’t too hard). I’ve also taken dairy out and I just feel so much better. Not sure if I’ll even be 100% vegan but you have a beautiful and inspiring website! For me desserts comes first. I just want to try your recipe. I love you eat something sweet but healthy and I think your recipe counts. I just make sure I eat healthy and wholesome food. Absolutely delicious! We LOVED it!! Thanks Angela! I had been eying this recipe for a while but me being the lazy baker I am it seemed kind of complicated. Alas it wasn’t at all and it turned out wonderfully. I was concerned about the coconut milk topping as it’s not sweet but put all together it was just the right amount of sweetness. This is probably my 3rd or 4th recipe I’ve made from your blog and once again i was not disappointed. Keep the fantastic recipes coming! You could go through the process up to spreading the toffee into the crust and then freeze it. Just thaw and do the bananas and coconut cream the day you are ready to serve. Yes? Just wanted to post to let you know how much everyone enjoyed the pie! One of my best friends has an intolerance to diary and wheat and I made this as part of her birthday dinner. She loved it as well as everyone else who had a sample (there wasn’t much left after the initial dinner). Then I made it for mother’s day and again the whole fam loved it (including those who are cautious about vegan cooking). Thank you for posting as I would not have heard about it otherwise! This looks really delicious. My mouth is already watering. Hope to have this one day.Anyway, thanks for sharing. Do you think the crust would be fine prepared ahead of time, like earlier in the day? I want to do the filling right before serving but am looking for ways to spread out the cooking. I just made this with great success, it was absolutely delicious! Gave the right amount of sweetness for a dessert. Wasn’t sickeningly sweet like a recipe involving cans of pre-made toffee pie filling would have been. Felt like a great treat humans should actually eat, that is! Made this…LOVED IT!!! It lasted really well for a few days, too. Would love an option to cut the full-fat coconut cream with something a bit lighter, but as-is, totally yummy, too! I made this and it was good the first day. I really didn’t think the bananas would last a second day but they did. I think the pie was better the second day! I think it all depends on how ripe your bananas are. This pie looks very delicious and loving all the pictures! To me, banana makes every dessert special, and this one is no exception. I can’t wait to make this! I lived in England for 3 months last year and had traditional Banoffee pie, but I am a plant based gal and this sounds fantastic and much healthier. Thanks for sharing Sara’s recipe. I haven’t purchased her cookbook yet, but intend to, and I intend to buy yours as well! I hope your Easter dinner was a smashing success! Cheers! I can’t wait to try this one too!! Yum-ME! I made this for a dinner party the other night with two other couples. One couple who eat and love vegan, the other total meat eaters. Let me tell you everyone loved this. Even the meat eater man who didn’t have so much love for my quinoa/kale salad told me three times how much he liked this. I will be making this again for sure. What a perfect birthday treat! Definitely going to give this one a go this weekend! The perfect blend of healthy and nutritious ingredients to make a very tasty favourite! This pie is amazing! I tried Banoffe pie for the first time recently, and it was a good concept but just too sweet. This version blew my mind! Last night i tried this it came really so yummy and tasty…. Wow it was looking so yummy.Thanks for sharing this yummy pie…. Hi, I don’t have dates, can I use raisins instead? Thank you. I can’t eat almonds, do you think I can change the almond butter for tahini? Or maybe I could make a butter with a different nut that is not almond or peanut? This was well-received by my non-vegan friends! However, the tart base was particularly fragile, despite following the recipe strictly. Anyone with tips on how to keep it together? I made this at the weekend and it was a huge success! couple of small things… I made it in a 8 inch pie tin and think a tin a wee bit bigger would have been good, and I added vanilla and a tiny bit of stevia to the coconut cream, but really it didn’t need the addition afterall. This pie is very filling, you only need a small slice to satisfy a sweet tooth. I would for sure serve this to any “non-vegan” friends and love that about any recipe I’ve tried from Oh She Glows :) Thank you so much Angela!!! Thank you so much for this recipe, I made it yesterday (and didn’t even need to go to the store, just like you said :)) and it is AMAZING! New favorite! This pie is my new favorite indulgence, and I love having something wonderful but healthy that I feel is tasty enough to serve to guests! I have been gluten and dairy free for about 7 months now. Something about my gut changed after an illness last year, and after too many tests to count, my doctor suggested removing those allergens from my diet. It has made all the difference for me. Thank you so much for sharing this recipe. I love to cook (and to eat! ), and I am really looking forward to trying more of the recipes on this site. So many of the GF/DF recipes I have tried have been dry, mealy and lacking any rich flavor. Thank you for producing recipes that are the opposite of that! Just made this for work last week and it was a total hit! I started making the crust during Snowzilla when I realized that although I had dates, I did not have enough for date carmel! The crust survived in the freezer until I scrounged up more dates (and got back from vacation) and was finally able to put this delicious pie together! At that point the crust had dried out a bit but it was still great mixed up with caramel and coconut whipped cream. I’m so glad to hear it worked out, Jodi! I have had my eye on this for a while but needed the right occasion ( and time) to make this. it was worth the wait! so delicious everyone went back for seconds. the dairy eaters, the gluten eaters and even the ones who didn’t like coconut! it wasn’t a quick recipe, but it was delicious and worth it ! Hey Maxine, I’m so happy to hear the pie was such a hit!! That’s awesome. Thanks for taking the time to let me know! I’m happy to hear you enjoyed it, Jeanette! So glad you enjoyed it, Maja! Just made this for my husband’s birthday and it turned out beautifully! My 5 year old son loved it too. Thanks for the recipe! Thank you, thank you, thank you for this recipe! Being gluten intolerant and vegan I had pretty much given up on good dessert. This pie is delicious and as you eat it, you feel it is also good for you. And this kind of crust opens to a lot of possibilities. I have this recipe already assembled and chilling in my refrigerator for dessert tonight. I’m sure it will be wonderful as all the ingredients were delicious individually (of course I tested them along the way). I will add an update once consumed. One thing I ran into was getting the coconut cream to firm up properly. I added a couple teaspoons of arrowroot powder and whipped it with an electric mixer and this seemed to help it hold it’s shape a bit better, even as it sat at room temperature. I figured someone might find this tip helpful. Absolutely delicious, subtle flavors blend. My daughter’s favorite dessert! Delicious! I was concerned that the pie wouldn’t be sweet enough because the coconut cream was unsweetened, so I drizzled some maple syrup on top of the cream. When I served the pie the day the following day, all the sweetness from the date caramel and bananas permeated through the cream. It was almost too sweet with the maple syrup I added. Hey Carolyn, I remember worrying that it wouldn’t be sweet enough too, but was pleasantly surprised when I served it! Thanks for mentioning this as I’m sure others will benefit from the advice. Thanks so much for trying it out! I made this for a dinner party tonight. It was lovely. So light. No stodgy. Thus wiĺl be a firm favourite. So easy to make too. I will use oatmeal and almondmeal. How much do I have to use then? Hi Nele, You are too funny! :) You can use roughly the same almond of oat meal and almond meal. Made this and loved it! Definitely feel that the flavor was better the 2nd or 3rd day. Thanks Emilie, so glad you enjoyed it! I have made this recipe at least 5 – 10 times a year since seeing it 5 years ago. I try other tarts and pies as well, but I always find myself coming back to this one. It’s light, but rich. Sugar free, but sweet. My vegan, and non – vegan friends and family both love it; and now its a staple dessert at Thanksgiving. Hi Angela, I love your website. Do you recommend using salted or unsalted almond butter, raw or roasted? You can use any kind of almond butter you prefer…I find all of them work. I tend to go for unsalted roasted almond butter most often because I find the roasted flavours goes well with the baked crust, but raw will work just fine too!